The Solway Firth viewed from the air. 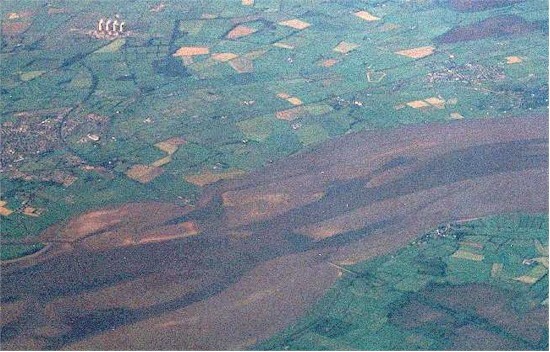 The former route of the Solway Firth vaiduct can be seen running from middle left to bottom right. The approaching lines can be seen and the route of the Glasgow, Dumfries and Carlisle Railway can also be seen. The view looks north east; England is to the bottom right and Scotland is across the top. The town of Annan is on the left. This line ran from Kirtlebridge to Annan, the only town on the route, and on to the Solway Firth through farmland. It crossed the Solway Firth (fairly shallow with extensive sandbanks) and then ran through rural Cumbria. From Kirtlebridge to Aspatria over the Solway Firth. The line between Kirtlebridge and Annan Shawhill was owned by the Caledonian Railway. The line from Annan Shawhill on to Brayton Junction was owned by the Solway Junction Railway. The crossing of the Solway firth required a long bridge which was demolished some time after the line was closed. The remnants of the bridge caused damage to vessels operating in the Solway Firth and the London, Midland and Scottish Railway were required to clear the channel.